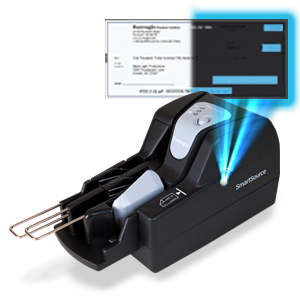 The SmartSource® Professional check scanner is a perfect fit for easy, fast integration with teller or remote deposit capture applications. It is one of just a few scanners on the market with two-pocket sorting capability in a desktop-sized form factor, and now has speeds up to 200 documents per minute. 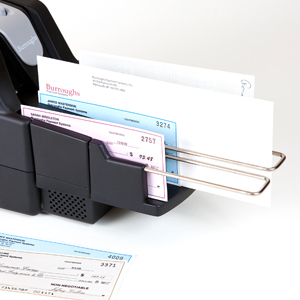 Standard features on the Digital Check SmartSource Professional series of check scanners include an auto-feeder with an open feeder designed for improved productivity, industry-leading Magnetic Ink Character Recognition (MICR) reader, easy remote deposit capture applications, and superior image quality with 300 dpi image cameras. Rapid cleaning mode allows quick cleaning with no removal of external covers. SmartSource scanners use the same “waffle” cleaning cards as the TellerScan product line, to remove the maximum amount of dirt and dust while cleaning hard-to-reach areas inside the scanner track. The ink used in SmartSource Inkjet cartridges is specially formulated to eliminate the need for cleaning the cartridge. SmartSource’s Inkjet endorser can print up to four lines on the back of a check or money order, capturing nearly any information you need to convey. An optional front franker physically marks checks as deposited, a requirement of many financial institutions.